Popularly called “the Greatest Show (and Tell) on Earth” Maker Faire Rome equally attracts all ages – from kids eyeing up 3D printed toys, to adults wondering what kind of software is being used for the printing. Everyone was excited to showcase their newest invention, or to detect the next-big-thing is going to be. It was the perfect place for an interchange of ideas and bringing different groups of people together. We were happy to share our slice of the knowledge pie, talking about programming microcontrollers in Python, using Blockchain for IoT applications, Zerynth tools in industry 4.0 projects and more. The Zerynth team was graciously hosted by RS Components at their booth. Ever since we entered into a partnership with them, and through it provided the possibility to download Zerynth tools straight from DesignSpark, more and more developers have been reaching out to us. So, our stay over the weekend at the RS Components booth made perfect sense. Take a look at the images below, to get the feel of the busy, exciting atmosphere around the booth. We certainly had fun. On Saturday we had a workshop titled “From “Hello World” to professional industry 4.0 applications using Zerynth”, where we explained all the ways you can benefit from our tools. We started the workshop with an overview of Zerynth tools and moved on to a more practical part where we showed how easy it is to program 32-bit microcontrollers in Zerynth Studio. Our CTO, Giacomo Baldi, had a talk on Saturday where he discussed the popular topic of applying Blockchain to IoT applications. If you want to learn more about this topic, read Giacomo’s article about using Python on microcontrollers for Blockchain and IoT applications. 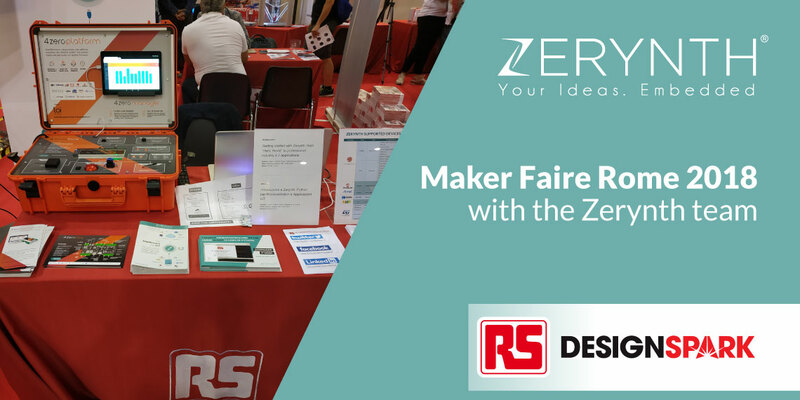 On Sunday, the last day of Maker Faire Rome, we held a talk at the RS Components booth. It was an introduction to Zerynth and our tools, for everyone who is interested in learning more and starting their Python adventure. To learn more about Maker Faire Rome, visit the official website. Do you want to start programming 32-bit microcontrollers in Python? Download Zerynth Studio and start today. It’s free and available for Windows, Linux, and Mac OS.